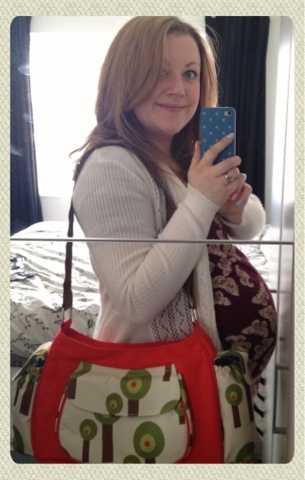 I spent some time choosing a changing bag as I wanted something that would actually be practical but nice to look at and not too expensive - just like every other mum-to-be wants. I had a feeling that work would buy be a bag as my baby gift as this has always been a bit of a tradition so I wanted to gently point them in the right direction so I'd have something I'd really get a lot of use out of. I loved the Yummy Mummy range from Pink Linings - it's the girly girl in me - and knew these were really popular, having read reviews and seen some being used by real mums out and about. However, the price just seemed too much compared to some other bags which seemed to offer the same functionality. If I was buying for myself, I couldn't justify £70 for a bag when a £40 bag seemed to fit the bill. 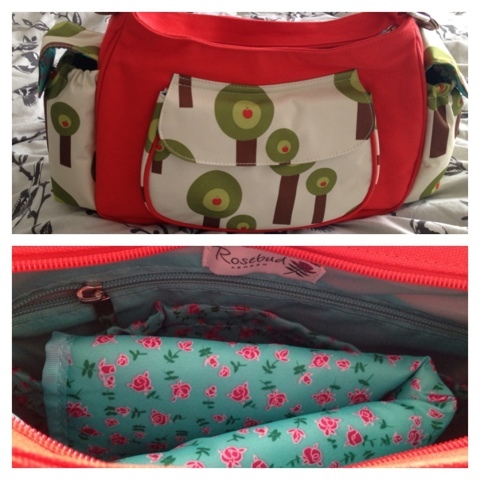 So, I chose the Rosebud London Hobo design in Family Tree print. I loved the style and the pattern was bold, bright and not overly girly (Ste will have to use it too), if you ignore the blue and pink flower lining! Rosebud London is also a spin off from one of the designers behind Pink Linings so it's still something special, just less pricey. I had looked at the measurements online and it only seemed to be an inch or so smaller in width. For too long now I have filled my own handbags with too many things that I just don't need - if I have a bigger bag, I will fill it but when I have a smaller bag, I somehow manage (although I can't be the only one who seems to lose their keys / lipgloss / sunglasses the second they are thrown in with everything else, even in a clutch purse). Also, I know it's easy for me to say this whilst baby is still in my tum, but you can't honestly need to to take THAT much out with you, can you? Surely a few nappies, nappy bags, wipes, cream, a change of clothes, a muslin cloth plus a toy or two, is all you need in your bag, plus a bottle if you're not breastfeeding? If it's sunny, you may need a hat or if it's cold, a blanket, but they're more likely to have this with them in the pram. With all this in mind, I think my Hobo changing bag will be just perfect - there's even a pouch on the outside for mummy's things too. However, I appreciate there must be days when you just have more stuff, perhaps because the weather is changeable or you have more things of your own to carry. That's why I have developed my own solution to turn any bag of a decent size into a changing bag. I saw a gorgeous Babymel bag in Mamas and Papas - slouchy yet structured tan leather look with loads of storage space hidden behind a beautiful, 'normal' looking handbag design - but at £75, I had to walk away. 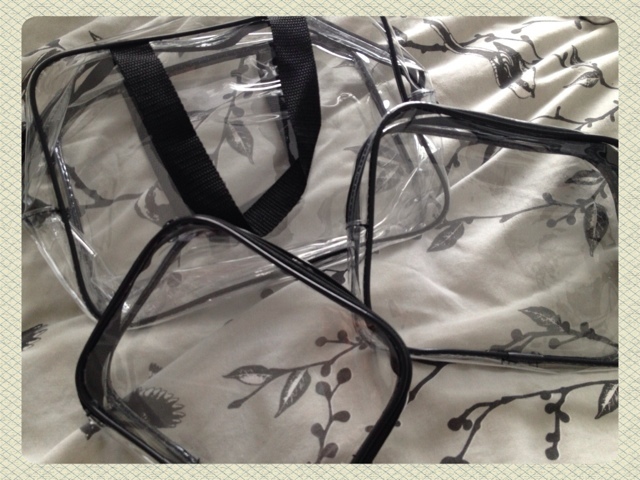 Instead, determined to prove that you don't have to spend a fortune to get a changing bag that works for you, I went to Superdrug and bought a set of clear plastic cosmetic bags. The smaller size is perfect for travel size toiletries, the medium bag is great for a few nappies, nappy bags and baby wipes and the largest size is ideal for spare clothing. At the bargain price of £6.99, I have created a practical solution that will mean any bag that I or Ste have (aside from my evening bags which will be pretty redundant for a long while yet) into a changing bag. Easy to locate when in a rush and convenient to use out and about, I'm really pleased with this simple solution. Of course, I *had* to buy a new handbag, being a yummy mummy in the making after all, and I found the perfect option for me in Next. 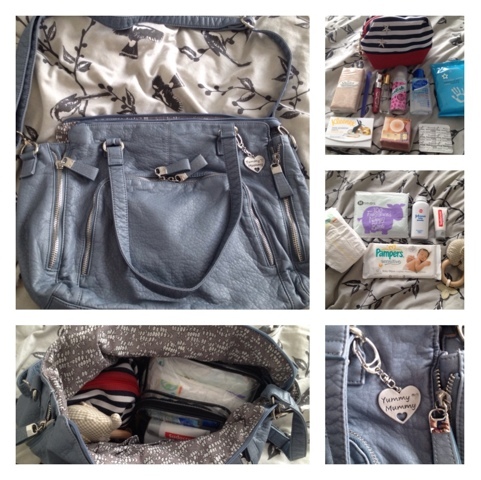 It's soft faux leather in a very wearable denim blue tone, has good shoulder straps plus a longer, detachable strap for cross body / pram use and plenty of room, including an outer pocket for easy access to my mobile, keys, purse etc. I tested this out earlier, putting a mummy cosmetic bag of essentials inside along with the baby bags as described, and found I still had space and the bag didn't weigh too much. What I love about this idea is that Ste can also use the smaller baby bags with any of his own satchel type bags, so he has a daddy solution in case my girly bags don't float his boat. Finished with a lovely keying bought by a friend, and this Next bag is another solution for me when I want something bigger and more in-keeping with my summer outfits. See below some pics of how I pulled this together and the essentials I'm anticipating using. Any new mamas who have their own suggestions, please let me know!